I’m back…. 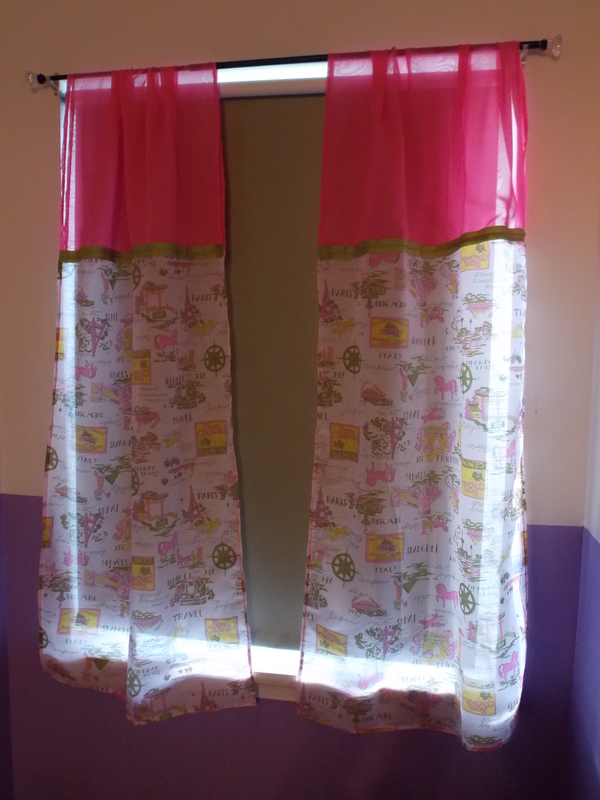 this time with another show and tell of handmade curtains I had made for my daughter’s room recently. The inspiration for these came from this cool sheer fabric I found at either Goodwill or thrift store probably a year ago. Here’s a more close-up look at this fabric. 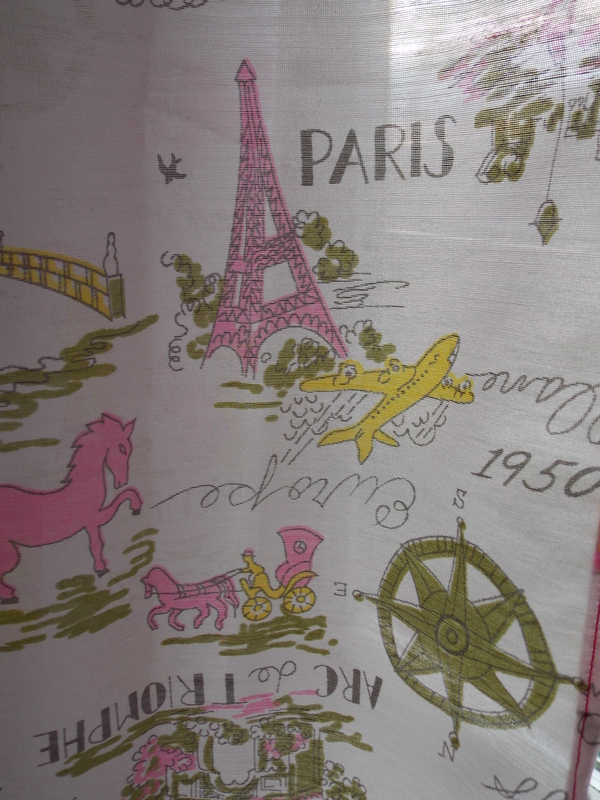 I have no idea how old this fabric is, but it had a nice vintage look to it with all of these world travel locations and icons. 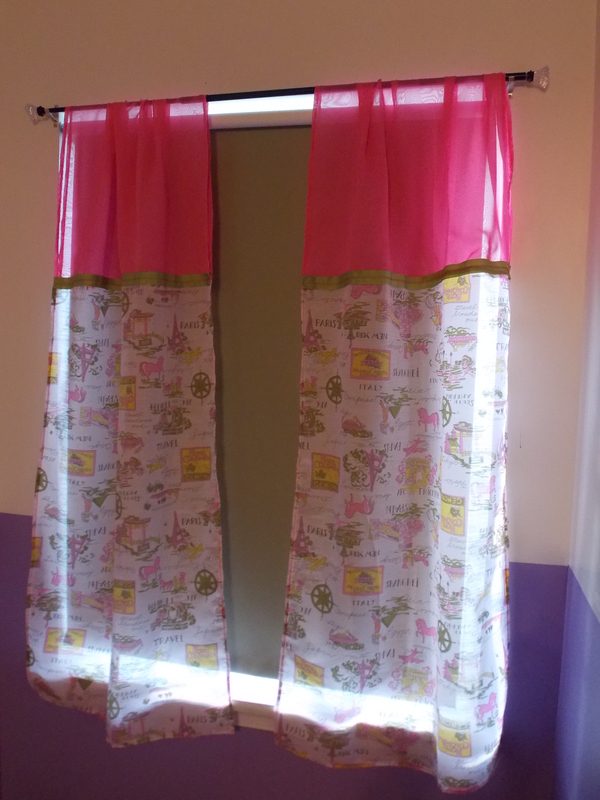 I didn’t have quite enough to make two full sets of panels, so I used sheer pink chiffon to help complete these, doubling it up and making a loop for the curtain rod to go through. I do have to admit that I never really had much experience working with sheer material. My vintage material wasn’t too tough to work with, but the pink chiffon was a little too “slippery” to work with for my taste. 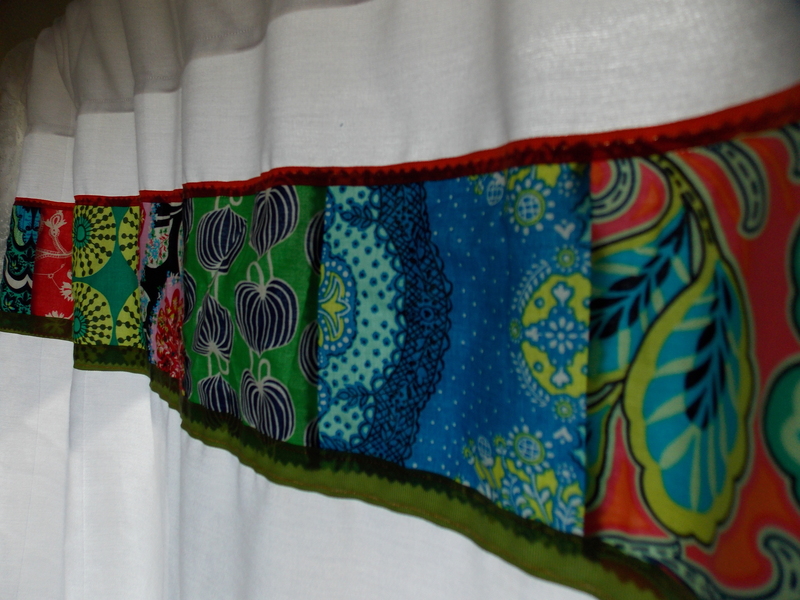 All in all though, I was pleased with how these turned out and rather enjoy making curtains. 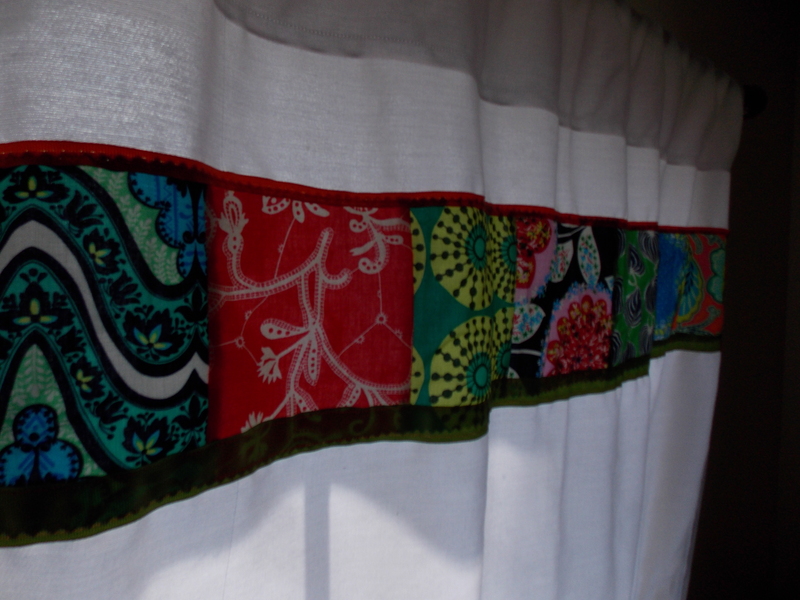 With the approach of some *possible* spring weather, I’ve been on a curtain-making binge. Yep, 4 of our rooms now have different curtains hanging in them. I’m a little nutty like that when I get on a kick. Today I’ll be sharing the ones I made for our living room. Oh, and by the way, I hardly spent a thing to make them. 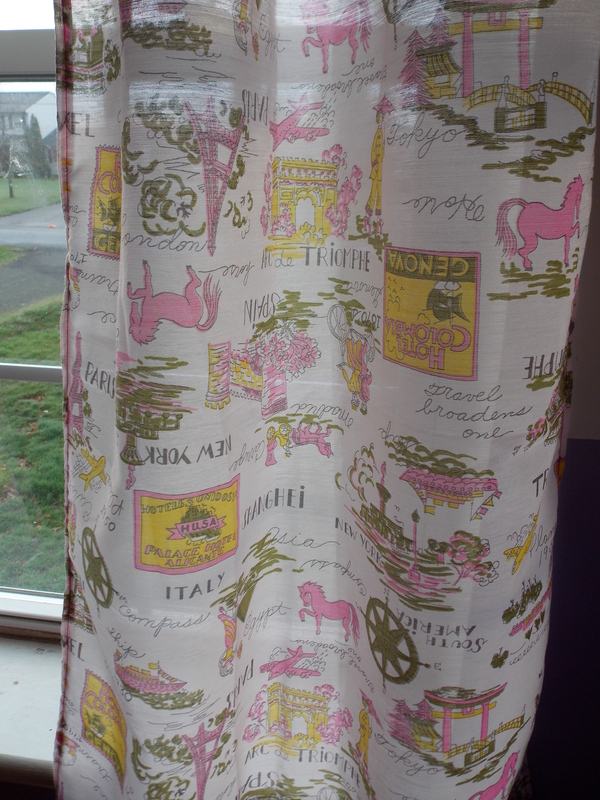 Store-bought curtains can be so stinking expensive! I’ve priced them out before and even if you think you’re getting an okay deal, that’s sometimes just the price for one half of a window. With an overflowing fabric stash, I raided it and found something unique for each of the rooms. 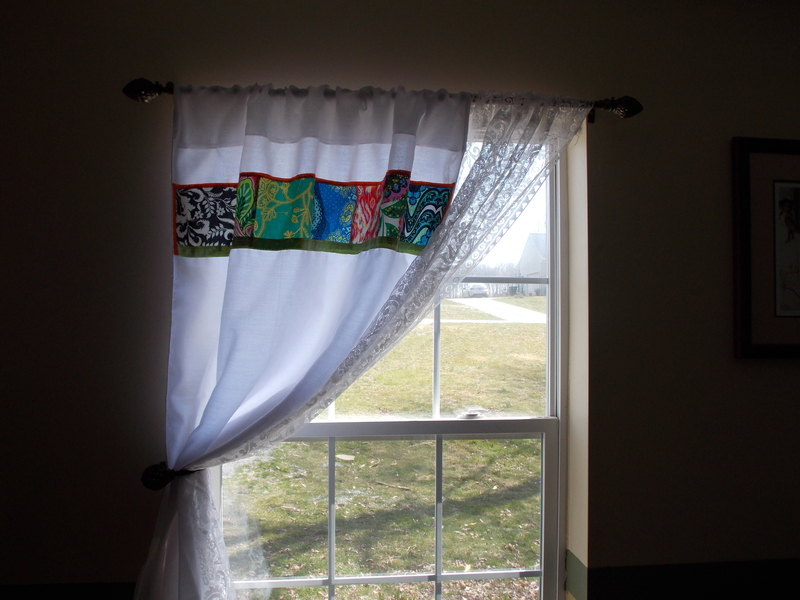 It was in perfect shape, so I cut it in half and used that white linen as a base for my curtains. My other ones were much more formal-looking valances. I was looking for something more casual and bright, so the white fit the bill for that. To add some pops of bright color, I embellished these with some quilting squares I had won off of Ebay. They are Amy Butler fabrics–I forget the name of the collection, but thought they were very pretty. 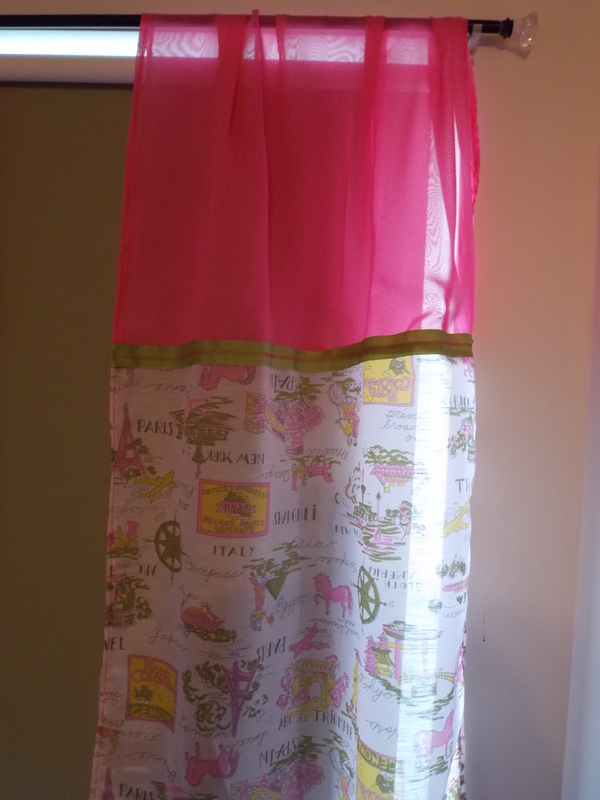 Basically I sewed a few together in a strip, then sewed them near the top of the curtain. I have a bunch left, so I may make a matching pillow to go with. I love the colors and designs in these squares! For some finishing touches, I sewed on a length of orange grosgrain ribbon to the top and a length of green to the bottom of the squares. 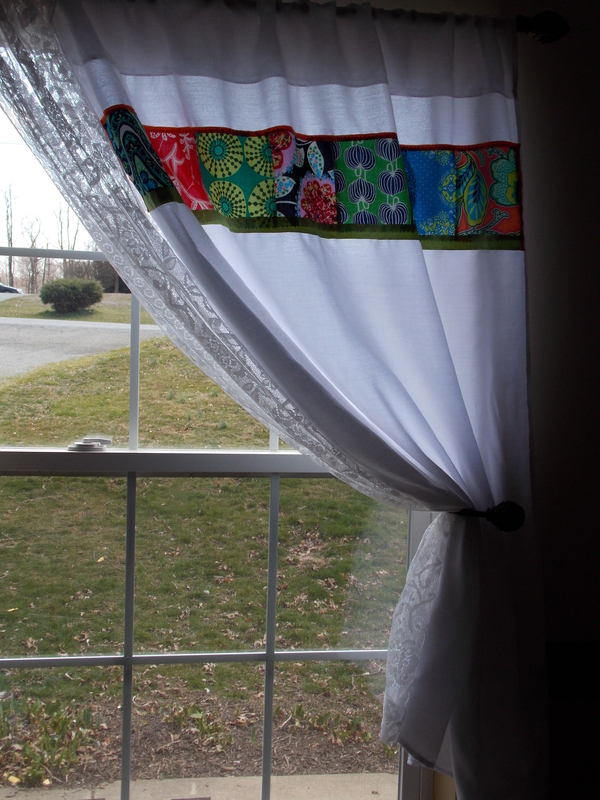 Hanging with my handmade curtains are lace panels that I’ve had for many years. All in all, I am enjoying my new curtains and think they definitely give my room a different look. You never know what you can come up with when thinking a bit outside of the box! 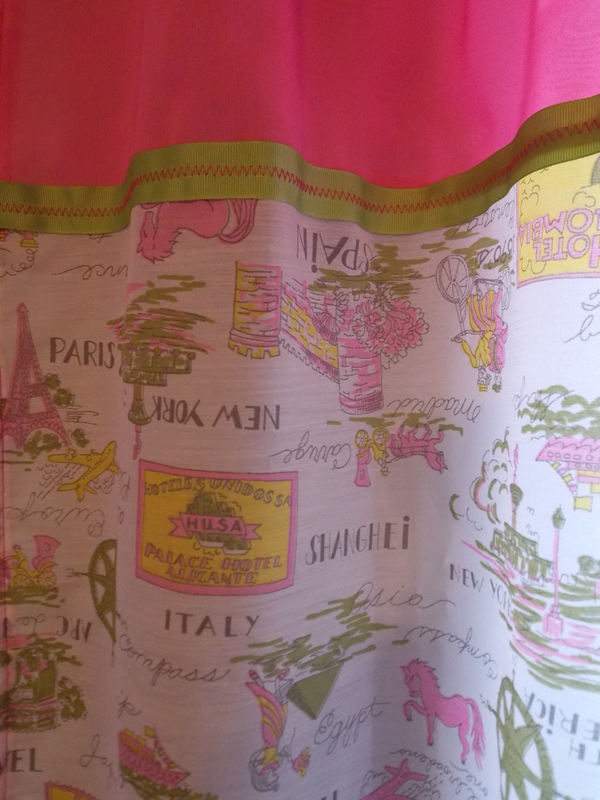 I may be sharing some of my other curtain-making adventures in the near future, so stay tuned! !